EVANSVILLE, IN March 31st 2016 – A Spring Runway, Trunk Show, and Dinner featuring high fashion at bargain pricing is returning on Thursday night 3/31/16 at 6pm in the Holiday Inn Ballroom located at Highway 41 North. 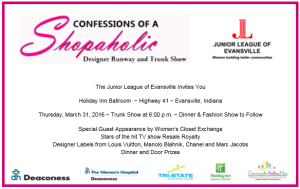 Confessions of a Shopaholic is sponsored by the Junior League of Evansville, with the Women’s Closet Exchange, provided in part by the generosity of Deaconess, Deaconess Women’s Hospital, Tri-State Athletic Club and Holiday Inn. Purchase our tickets today! Women’s Closet Exchange has built a reputation for making designer fashions available and affordable to everyone. From Louis Vuitton to Manolo Blahnik, Chanel to Marc Jacobs, they offer the name brands that you love in pristine condition. WCE travels the country regularly in search of the hottest contemporary fashions at market, typically found exclusively in boutiques and high-end retailers. 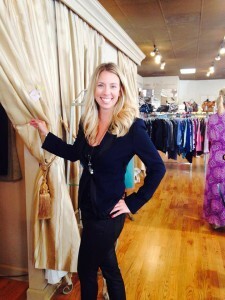 With over 25 years in business, they are nationally recognized as one of the top designer resale shops in the country. Women’s Closet Exchange has built a reputation for making designer fashions available, and affordable, to everyone. From Louis Vuitton to Manolo Blahnik, Chanel to Marc Jacobs, they offer the name brands that you love in pristine condition. With over 25 years in business, they are nationally recognized as one of the top designer resale shops in the country. From the original boutique launched in 1984, with a footprint of just 400 square feet, to our current location spanning over 4,000 square feet, Women’s Closet Exchange has become THE destination for style-minded women who know how to dress like a million dollars—without spending it. Our evening with WCE is an evening of high fashion, low prices, cocktails, dinner, and dessert! Tickets are $50 a person (dinner and show included). Doors open and the trunk show begins at 6pm. Dinner will be served at 7:00pm followed by the runway show at 7:30pm. The trunk show will reopen immediately following the runway show. 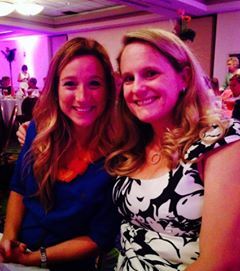 Proceeds from the ticket sales will benefit The Junior League of Evansville, Indiana, it’s mission and charities.